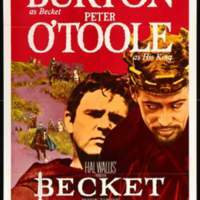 Becket, released in 1964 by Paramount Pictures, details the friendship and eventual falling out between King Henry II (r.1154-1189) of England (Peter O'Toole) and Thomas Becket (Richard Burton).2,3 The movie was directed by Peter Glenville, who received multiple award nominations for his work on this project.2 The storyline is based the French play Becket ou l'honneur de Dieu (1959), which translates to Becket, or The Honour of God.2 Both adaptations come from real historical events but both take dramatic liberties. Becketis set in twelfth-century England, France, and Rome. In the film, Becket is a Saxon who rises to a higher social status through his friendship with Henry. The Saxons are a conquered people and portrayed as lowly and impoverished. In the first half, Henry has a close relationship with Becket, appointing him as Lord Chancellor so that he could have someone he trusts in the position. In the second half, the Archbishop of Canterbury dies, and Henry sees this as an opportunity. For the same reasons he appointed Becket as Lord Chancellor, he nominates Becket to fill the position of Archbishop of Canterbury. Unfortunately for Henry, once Becket enters the position, he chooses the honor of God and starts defending the rights of the Church and helps the poor. The work that Becket dedicates himself to as Archbishop goes against the wishes of the King and the two friends find themselves at odds with one another, which in a sense also plays into the larger conflict between the "Saxons" and "Normans" in the film. The difference between the two groups, the Saxons and Normans, is shown right away in the film. In the first half, King Henry II and Thomas Becket's friendship develops in scenes of debauchery and bedding women. During a hunt, King Henry and Becket seek shelter from the rain, so they invade the house of an impoverished Saxon family who live nearby. Once inside, the Saxons are weary of the King as he mocks them and lusts after the daughter of the family while Becket is depicted as compassionate towards the family. For most of the film, Saxons are portrayed similarly to this family, impoverished, living in huts, and at the complete disposal of the nobility. 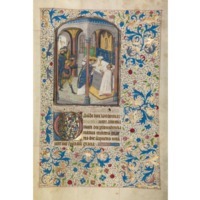 Such is their oppression that King Henry orders that the daughter of the Saxon family be brought to his castle so that Becket can sleep with her. It is in in this scene especially that King Henry seems to treat the Saxons as if they are his toys or property. This incident sets up the distinction between Normans and Saxons that carries on throughout the film. Henry is a Norman King and his (as well as most Normans’) view of Saxons is reflected through this scene. Saxons are seen as being inferior compared to Normans, who conquered them and can exploit them for selfish reasons. Becket’s treatment of this Saxon family is very telling of this social divide. Becket, who used to be a Saxon, sympathizes with the family and treats the family like people, not objects like Henry. Scenes like these are juxtaposed with others like it in the second half of the movie when Becket becomes the Archbishop. When Becket is preparing for his new position, he feeds and then gives clothes to the poor in Canterbury. This scene shows the beginning of Becket's newfound devotion to God’s work rather than the king’s, and plays into the overarching theme of Saxon and Norman conflict in the film. In honoring God, Becket begins works of charity for the poor, who are Saxons here. Becket begins to rediscover his Saxon heritage and in turn starts to identify as a Saxon. The conflict that ensues between Becket and Henry is in many ways symbolic of this social conflict. Becket is a film that tells the tale of the relationship between King Henry II and Thomas Becket. 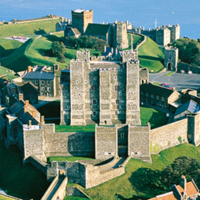 Through their story, the struggle and conflict between "Normans" and "Saxons" can stand in for the variety of social, economic, and ethnic divisions and inequalities (for both the present and the middle ages). Historically, the difference between Normans and Saxons stopped being relevant only a few generations after the Conquest.4 However, the film creators are most likely commenting on the class or ethnic differences of their day. 2"Becket (1964)." IMDb. Accessed March 07, 2018. 3"Henry II: 1154 - 89." English Monarchs . Accessed March 08, 2018. 4Ibeji, Dr Mike. "History - British History in depth: The Character and Legacy of Henry II." BBC. June 20, 2011. Accessed March 08, 2018. 5Knowles, Michael David. "Henry II." Encyclopædia Britannica. October 04, 2017. Accessed March 07, 2018.